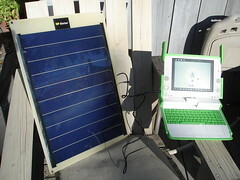 A solar panel arrived today for the XO laptops in my classroom. 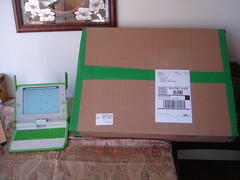 How many packages come to your home held together with GREEN packaging tape? Testing over the weekend at home, to school next week. Can't wait to see a 7 year old try to lug that thing around in Peru. I see this as a tremendous hands on learning opportunity for my third graders this year. Can we actually power an XO, using only the energy from the sun, for a school year? Can we do it in Seattle? Can it power more than one? How does electricity work? How do batteries work? What is solar energy? I can't wait for that. This panel is 14 volts, with 10 watt output. Doesn't roll up, but is very lightweight and durable. I bought it from xoexplosion.com. The flyer that came with it led me to the manufacturer's website in China, where you can get them delivered to the US for $63 each, $45 less than I paid. If this one works for us during the grey Seattle winter months, I'm going to order a couple more, from China this time. Too much, too fast, too soon?